Star Bright Symphony Musical Toy is rated 2.8 out of 5 by 10. 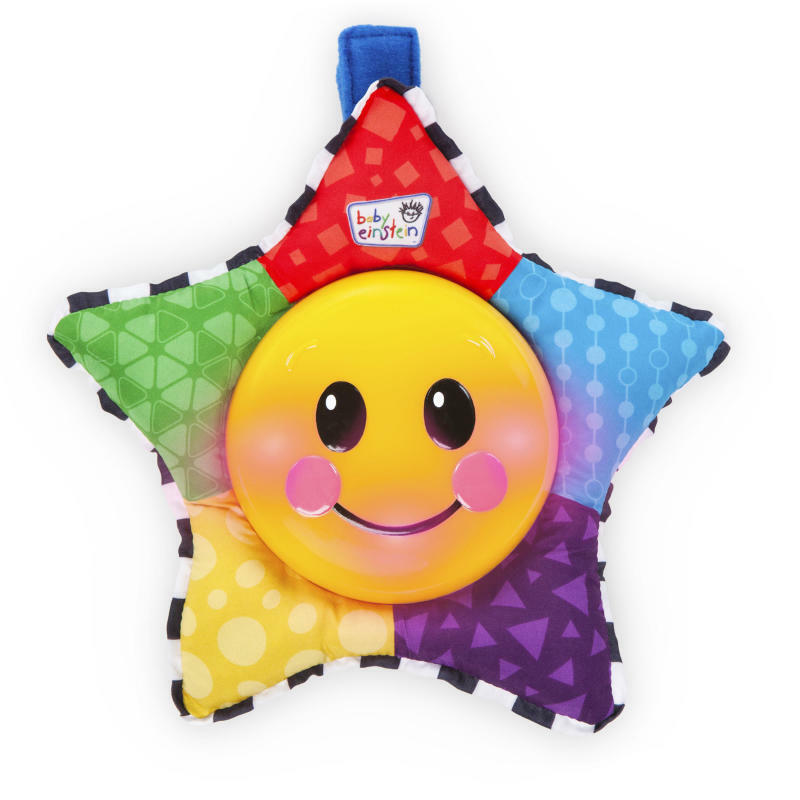 Star light, star bright melodies will mesmerize your baby wherever you are. With the easy Velcro fastener, this cheerful take along toy from Baby Einstein attaches to strollers, cribs, carriers and more. Soothe your fussy baby with the magic of musical discovery and gentle glowing lights. Dimension (in) 7.25" x 2" x 7.25"
Rated 5 out of 5 by Mommys Honest Reviews from Must have toy even w/o music The music part broke on ours like others that have posted reviews but DON'T GIVE UP ON THIS TOY its worth it even w/o the music! I know how frustrating it can be when you buy a toy and soon after the music and/or lights no longer work but I need to tell you this toy has so much more love left to give long after the music fades. There is something about that big sunny smile that babies love. I kept ours even though the music doesn't work; have it face down at the top of the activity gym. We've used it in the car as well. When the baby looks up and sees that smiling sun the joy you see is so pure and warm. Rated 5 out of 5 by Daddyo from Best toy for our baby so far Keeps her entertained till she passes out. Rated 1 out of 5 by JuliaM from Music Skips I actually have two similar versions of this- one came with a playmat, the other I bought because my daughter loved it so much and we wanted a second. Now...both skip in music and get stuck, it is ridiculously obnoxious. I didn't save my receipt, or ask for a gift receipt from the baby shower playmat gift. Love the product- but it is not made with quality and customer service is lacking- no response at all! Rated 5 out of 5 by Countrylivin from Our baby loves it Can't leave home without it!! It soothes her in her car seat, as she's not a fan of car rides (yet). Rated 2 out of 5 by Momma Em from Good toy - malfunctioned quickly! We received this toy in December for our son and the music is already malfunctioning! I wouldn't even call this breaking since it just hangs on his swing's arm. We use it a few times a week and he really likes it but the skipping music is kind of irritating! Rated 1 out of 5 by LunaKai from Poorly made, quickly breaks We got this for our daughter for Christmas. We don't even use the shake feature, but just leave it on the continues play strapped to her car seat. After two weeks, the music skips and replays the same 5 seconds of the same song over and over, and the paint is already chipping off just from our handling it. It really turned out to be a waste of money.